Superb views, tranquility, sun, sea, beach and pool overlooking a Natural Park. New and luxurious, directly on the river and the sea, providing you-the unforgettable holiday. Located in a natural park, next to a typical and traditional fishing village, in a very quiet place. The apartment, 82 square meters, non smoking rooms, features a huge and sunny balcony with table and sofas for outdoor dining and relaxing, contemplating the magnificent views of the Natural Park and the Sea. It has a large bright living room with glass doors from floor to ceiling where you can also relax and dine in the interior, enjoying the fabulous views over the natural park and the Sea. It has a comfortable and cozy double bedroom (bed 160 x 200 cm) with huge closets. It also has a spacious full bathroom and a hall with lots of storage. The large, modern, bright and open plan kitchen is connected to a dining area that comfortably seats 4 people. All comforts throughout such as Cable TV , Internet, Air conditioning etc. Also private parking in the garage and free use of 2 Bicycles. 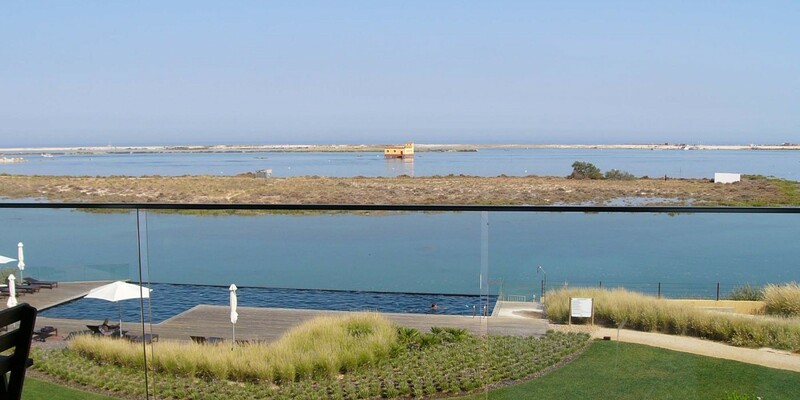 ou can enjoy the Ria Formosa Natural Park (ranked one of the 7 Natural Wonders of Portugal), directly from the balcony of the apartment. From here, you can observe the birds and enjoy the calm of The lagoon, or take long and varied walks or cycle rides by one of the 15 Kms of bike path paths which crosses the Natural Park. You can still stroll and bathe in fabulous uncrowded beaches, of the islands, several kilometers in length, which are also part of the Natural Park and are easily accessible by boat. These spectacular white sand beaches, lapped by warm waters, where you can enjoy the Algarve sun. Alternatively, just 500 meters from the apartment, there is the local "Tesos Beach" where the waters are always calm. The Village Fuzeta next to the apartment is a typical fishing village with white houses, equipped with a Traditional Market, Fresh Fish and vegetables, cafes, bars and restaurants, shops newspapers and magazines, supermarket and traditional produce. Also during October to May, enjoy the mild Algarve climate; You can watch birds, enjoy walks, peaceful biking, or golfing nearby. Explore the hills and Algarve interior, discovering towns and villages, while having as a safe haven this apartment where you will feel at home. This is the quiet and calm Algarve, with friendly people, in direct contact with nature and away from mass tourism, ideal for relaxing and refreshing holidays or long calm winter vacations. Price includes cleaning, linen, towels etc.